Two identical twins with matching lives have given birth to daughters just weeks apart – after unintentionally getting pregnant at the same time. Hannah Pountain and sister Lilli Paterson, both 31, were born just 14 minutes apart and have always done everything together – even taking their driving test on the same day. 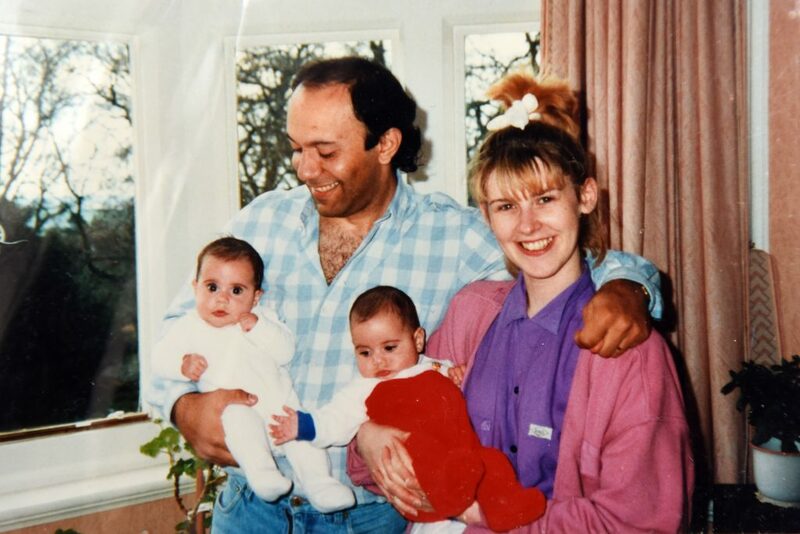 Pics by Caters News: Collect picture of Hannah Pountain and her twin sister Lilli Paterson when they were a few months old with their Mother and Father. 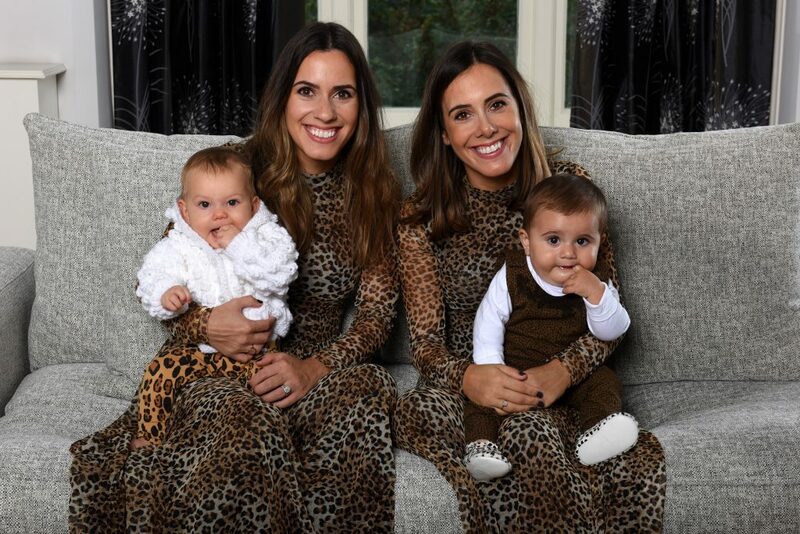 So the pair were thrilled when they discovered they had both fallen pregnant within five weeks of each other – with Lilli giving birth to eight and a half-month-old Bonnie in December 2017 and Hannah having seven and a half-month-old Lexi in January 2018. Neither fashion merchandiser Hannah, from Leicester, and doctor Lilli, from Northampton, knew the gender of their daughters in advance but the pair come from a family of four sisters and have only one male relative on their mother’s side. Hannah, the younger twin, said: “When our families discovered we both pregnant at the same time, they were shocked. Pics by Caters News: Hannah Pountain and her twin sister Lilli Paterson with their daughters. “We have always been similar, we have the same personality and even the same group of friends, and we both went to university together. “So to go through pregnancy and childbirth together was very special, a unique twin connection, and of course it was very beautiful. “Giving birth just three and a half weeks apart is something not many siblings can experience – let alone identical twins. “The feeling was completely magical and incredible. “It didn’t really sink in until after we’d both given birth – having someone so close to be so honest with and go through everything together with was nice. 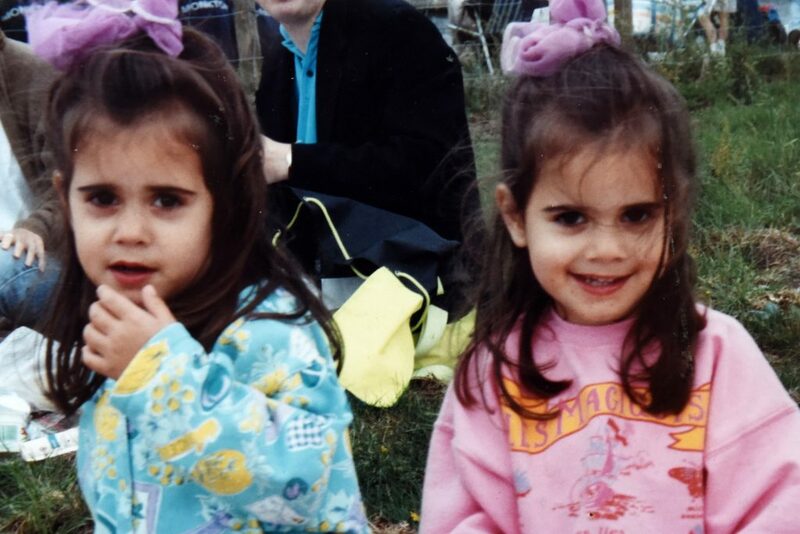 Pics by Caters News: Collect picture of Hannah Pountain and her twin sister Lilli Paterson when they were four. Lilli and husband Michael conceived very quickly after they first started trying for a baby in 2017 and were delighted to discover their pregnancy news in May last year. So quickly, in fact, that they found out the news before Lilli was due to get married in Italy in June 2017 – with Hannah the only family member to know her sister’s secret. So Lilli was gobsmacked when, the day before the wedding in Florence Hannah revealed she and husband Ben had also conceived after a year of trying and she was also pregnant. Hannah said: “When I discovered Lilli was pregnant, I was over the moon. “She kept it secret from the rest of the family, and I was the only one who knew about it. “I was just extremely lucky, I didn’t tell anybody and on my wedding day I just disguised it by holding drinks [alcoholic] so that people wouldn’t question why I wasn’t drinking on my wedding day. “So I knew when I told Lilli I was pregnant too, she was going to be ecstatic. The twins both decided to keep the news from their families for several weeks before revealing it to them when Lilli was 12 weeks’ pregnant and Hannah was six weeks’ gone. Sharing an Instagram account (@thetwinstories), the twins often share cute snaps of one another and their daughters – often in the countryside or on ski holidays. 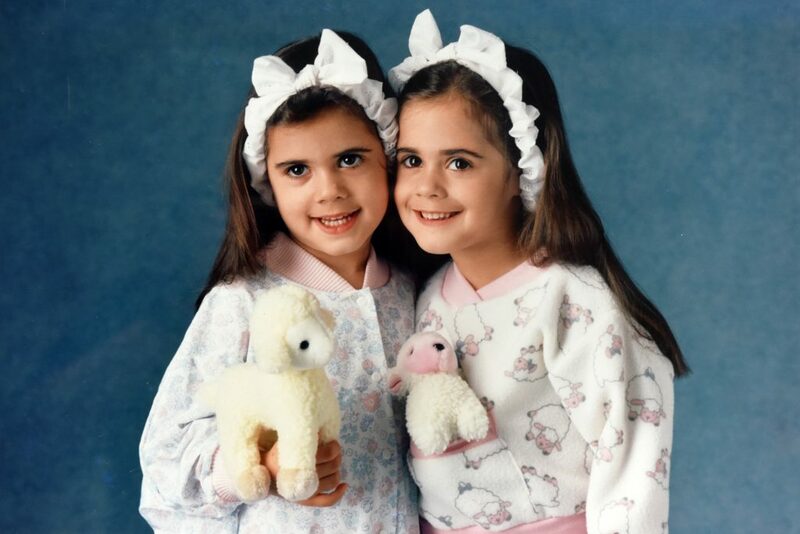 Pics by Caters News: Collect picture of Hannah Pountain and her twin sister Lilli Paterson when they were five. Incredibly, both sisters found out they were having girls in the moments after birth after they both decided not to find out the gender, based on what their mum had done before them. “Having a twin connection is the best! Like having a best friend all the time who you can be totally honest with, and they’ll be totally honest with you. Eczema sufferer has clear skin for first time after quitting steroid creams she used for over 35 years!